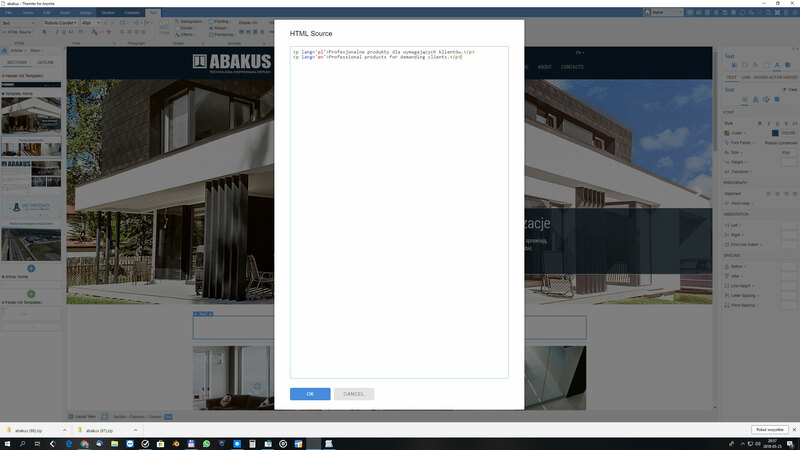 I try to enter tags in the TEXT field to change the language in HTML. I try to enter tags in the TEXT field to change the language in HTML. Unfortunately, no luck. You have added the lang attribute to the paragraphs, the syntax is correct. What behavior do you expect from this code? I have a static first page with animations. I have a website in many languages. I would like to change the static text in affluence from the language. The use of joomla modules is problematic. I have a static first page with animations. I have a website in many languages. I would like to change the static text in affluence from the language. The use of joomla modules is problematic. The lang attribute in the HTML tags only specifies the language of the content in this tag. And may be used by the translators and content reading applications. In case you need to translate the content you will still need some plug-in for the multilingual functionality. The first page is permanent. And I have to translate it. Of course, I can make a template clone, change it there, but I'd rather have everything in one project. Not to make corrections on 10 templates. I thought about making a copy of HOME and then copying the template and assigning to the language. Unless there is a way to incorporate language-dependent translations? http://www.abakus-okna.com.pl/en/ The first page is permanent. And I have to translate it. Of course, I can make a template clone, change it there, but I'd rather have everything in one project. Not to make corrections on 10 templates. I thought about making a copy of HOME and then copying the template and assigning to the language. Unless there is a way to incorporate language-dependent translations? Why do not you want to move all the content into the green content area so it will be the content of the article and create two articles in different languages and assign them to the appropriate language? And how to translate text in the slider ? Maybe you can do it using CMS CODE? The server side translation requires the text to be translated is wrapped into the translation function. Then the translation file should contain the desired key+value. As far as I know there are also a number of front end translation plugins like Gtranslate which translates the page on fly (on client side). The third option is replacement of Slider text with joomla position control where you will display joomla modules with the desired text. As far as I know you can hide/show modules by language.